What a wonderful start to a new year! I am excited about what God is doing in, and through, our ministry. 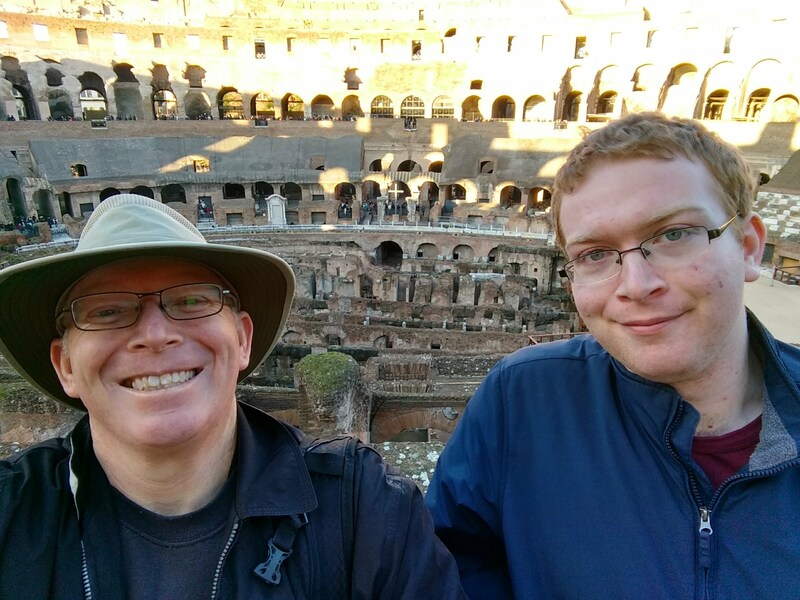 James and me inside the Colosseum. In the last letter I asked you to pray for a trip to Italy that our son James and I were taking at the end of the year. We spent the transition from 2017 into 2018 on a plane over the Atlantic ocean and arrived in Rome on the morning of the new year. We enjoyed walking around seeing, in real life, sites that were previously only pictures in a textbook for me. We enjoyed the typical sites. I was very much interested in the history of Rome as it affected the world we read about in the New Testament. I was struck by the fact that everything was so old and that nothing we would ever visit in the US can compare to the historicity of that ancient city. While visiting St. Peter’s Basilica it was our privilege to speak with a non-religious Canadian couple and share some of the differences in the teachings of the Catholic church compared to the Bible—particularly in what the Bible teaches about sin and our need of a Savior. Though I’ve seen how the Catholic church changes its doctrines from place to place, I was still amazed as to how different the church in Rome is compared to other countries I’ve been in. The church seems to integrate much of the false teaching from each local area it moves into. We had a good week-long visit with Shane Rice and his family as we were there to encourage them and talk about future possibilities of deaf ministry in Italy. I have made a photo album of our trip available if you would like to look through it. During the missions conference at Faith Baptist Church in Jefferson City, Tennessee I was asked to help teach one of our mission board’s SMART modules. This is a practical training curriculum that we have developed to “build more durable missionaries.” Though I have taught various subjects for SMART, this was my first time to teach our Leadership Development course. As is typical, I learned much more in my study and teaching than in the two previous times I have sat through the class. Our SMART classes are available to any missionary who would like to attend. We do not require that they be affiliated with BIO. If your church would like to host a SMART session during your conference for the missionaries in attendance, please contact me and I will be happy to give you further information. Part of my ministry in the office is in maintaining our computer systems. I am working on a couple of big projects that will update our infrastructure. I mention this to say that I covet your prayers on these projects. These are the kinds of projects that, if I do them well, no one will notice. Yet if something goes wrong it could mean days of stressful recovery to get back to where we were. Thank you again for your prayers for our ministry. A PDF version of our prayer letter is available for download.